(BREITBART)—The leaders of the European Parliament's largest party are pushing ahead with plans to introduce a European Union (EU) army, justifying the measure by citing concerns over "Russian aggression" and containment of the migrant crisis: "We are going to move towards an EU army much faster than people believe," European People's Party president Joseph Daul has said. 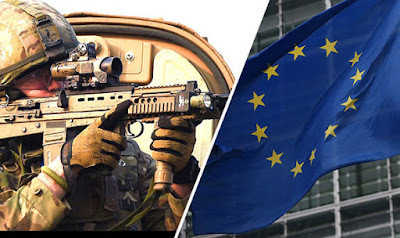 The party's plans go further even than those of Commission President Jean-Claude Juncker, who made waves over the summer with his proposals for a Common Security and Defence Policy (CSDP). Whereas Junker's vision was for a force capable of dealing with post-conflict missions, the party wants to see a force capable of taking on missions of a "higher intensity," according to reports from Euractiv. The proposals will be discussed at a summit held by the leaders of the European Peoples' Party (EPP), due to take place in Madrid next week. The centre right party holds 217 of the European Parliament's 751 seats, making it the largest single party in the Parliament, and was home to the British Conservative Party delegation in the Parliament until 2010. "European defence cooperation remains a patchwork of bilateral and multilateral agreements," read a comprehensive strategic note issued at the behest of President Juncker in June. "It is time for a reckoning: traditional methods of cooperation have reached their limits and proved insufficient. European defence needs a paradigm change in line with the exponential increase in global threats and the volatility of our neighbourhood," he continued. "EU's soft power must be matched by collective hard power and a more efficient use of our €210 billion yearly defence spending," it argues. The paper went largely unnoticed in the midst of the migrant crisis sweeping across the continent. The EPP's paper for discussion responds: "In today's security environment, the CSDP stand as one of the weakest spots of the EU's project for peace, integration and development. Rising threats must now lead to a change in mind-set. "Moving beyond CSDP's focus on post-conflict and low-intensity missions to being able to conduct territorial defence and higher intensity."